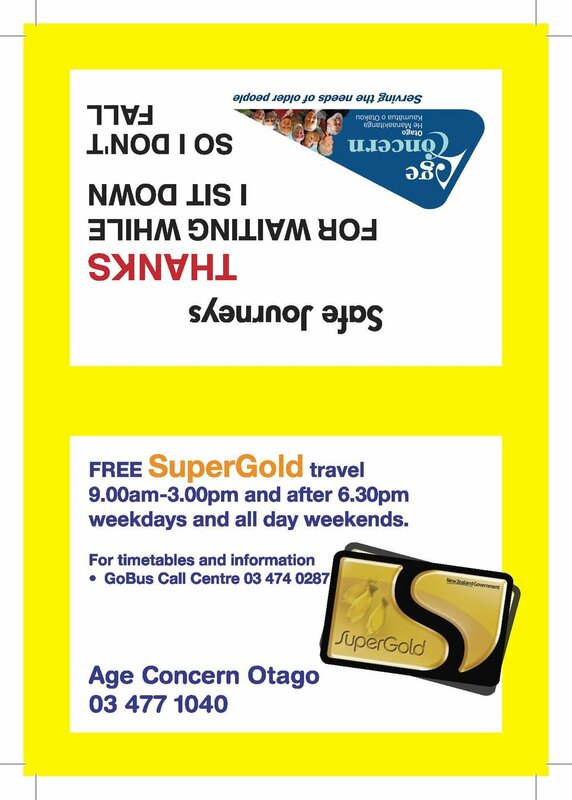 Age Concern Otago holds a number of publications at our office. If you would like a copy of any of the listed publications feel free to call in and see us. Age Concern Otago has released this updated Independent Living Guide; it’s designed to help Otago’s older people age well and stay in good health. The 24 page guide covers topics such as communicating about your health, being well within, making your home a safe place, preparing your affairs, getting out and about and keeping connected to your community. It’s crammed with resources, information and suggestions to assist in making informed decisions. The guide is free and we have plenty in the Dunedin Office if you would like to pop in to collect one, alternatively, download the full guide. Produced by Age Concern Otago this informative booklet is packed full of reliable ways to get around Dunedin and Mosgiel areas so that you can continue to do the things you love and need to do in your everyday life. This is an information resource that every home should have! Collect your copy from the Age Concern Office, alternatively download the full guide. Kerri & Bolty Dunedin North - Driving Miss Daisy North and Dunedin City Council. Age Concern Otago is pleased to provide you with information on sexual health and wellness of older people. Sexuality doesn't stop with age. The older person is a sexual person, when one gets older the yearning for intimacy, security, and belonging becomes intensified. Some people struggle to acknowledge that older people are sexual beings with the same desires and rights as the rest of the population. This booklet while written for older people, can be a useful resource for family members and caregivers. Some of the topics in this booklet may not directly affect you, but still be of interest. This booklet will not make you an expert, but it may be able to answer some questions that you have about this topic. To create this booklet a range of useful websites and research articles were found. These are referenced at the back of the booklet. We would like to acknowledge and thank Anika Paton and Kellie Hawkins, School of Occupational Therapy Year 3 Students for their professional approach and projectmanagement to help Age Concern Otago produce this valuable booklet on sexual health and wellness of older people in residential care.